Smerinthus planus Walker, 1856, List Specimens lepid. Insects Colln. Br. Mus. 8: 254. Type locality: North China. Synonym. Smerinthus argus Ménétriés, 1857. Synonym. Smerinthus planus meridionalis Closs, 1917. Synonym. Smerinthus planus alticola Clark, 1922. Synonym. Smerinthus planus clarissimus Mell, 1922. Synonym. Smerinthus planus distinctus Mell, 1922. Synonym. Smerinthus planus kuangtungensis Mell, 1922. Synonym. Smerinthus planus chosensis Matsumura, 1931. Synonym. Smerinthus planus unicolor Matsumura, 1931. Note. Mell (1922a) described Smerinthus planus juennanus from Yunnan. We were unable to examine any Yunnanese material. However, specimens from Sichuan in the CMNH, IZAS and collection of J.-M. Cadiou, as well as those illustrated as Smerinthus planus juennanus by Chu & Wang (1980), are generally greyer than Smerinthus planus planus, with a larger black surround to the hindwing eyespots and a weaker forewing pattern in many. Furthermore, Wang (1988) reported both Smerinthus planus planus and Smerinthus planus juennanus from the Namjagbarwa region of Xizang/Tibet, but recorded the former from Mutu at 850m and the latter from Nyingchi at 3050m. However, it is presently unclear whether this taxon is a valid subspecies or is simply a montane form (Kitching & Cadiou, 2000). The latter may well prove correct because bred pupae of Smerinthus planus planus from Xi'an, Shaanxi, that were chilled produced greyish adults similar to Smerinthus planus juennanus, whereas pupae exposed to dry heat produced typical brownish Smerinthus planus planus (Pittaway & Kitching, 2000). Wingspan: 66--106mm. Like a large version of Smerinthus ocellata. Spring brood individuals are the smallest, those which emerge in September or even October are much larger. Developing pupae exposed to cool conditions produce greyer adults than those kept drier and warmer. Imagines from the latter tend to be much paler and browner. A species of agricultural areas and deciduous woodland along valley bottoms in the Russian Far East (Izerskiy, 1999b). He states that females are active from 22.40h until 02.20h, males from 23.20h until 04.10h. 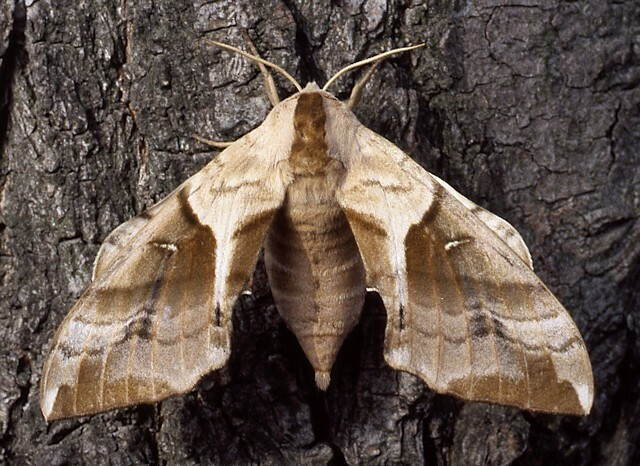 Emergence occurs just after dark and females call for a short period around midnight. Pairing lasts a relatively short time, sometimes only a few hours, and the pair often part before morning during warm weather. Oviposition may commence the same night immediately after pairing. In England, wild males of Smerinthus ocellata ocellata are readily attracted to calling females of Smerinthus planus planus, and the resultant eggs produce viable larvae. 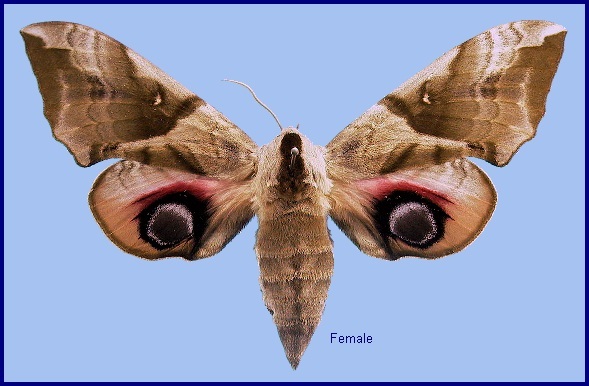 However, adult female hybrids rarely emerge and the pupae generally die after 2-3 years. Most male hybrids do eclose but fail to respond to calling females of Smerinthus planus planus. 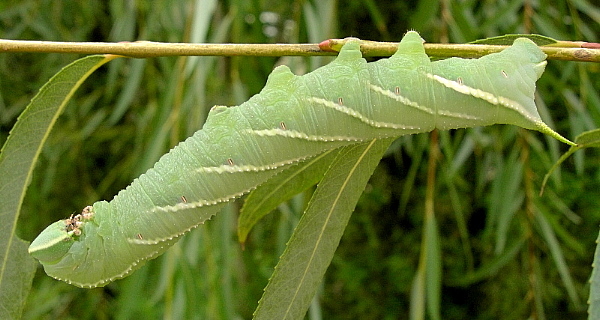 In the reverse cross (male planus x female ocellata), the resultant pupae diapause and emerge normally; however, this cross is difficult to achieve. The defensive 'glaring eye' posture of Smerinthus planus planus is more exaggerated than in Smerinthus ocellata. Smerinthus planus also drops to the ground more readily on being disturbed. China: 24.iv (Yili area); v-16.vii (Shandong); 15-23.vi (Nei Mongol; Sichuan; Beijing); vi-vii (Heilongjiang; Liaoning); vii (Hailin; Jiangxi); 20.vii (Shaanxi); ix (Shaanxi). Mongolia: 30.vii (Khalkhin-Gol). North Korea: 15-29.v (Chonma-san); vi (Pukchong); vii (Hamhung; Jueul); viii (Wonsan). South Korea: 5.vi [(unstated locality)]; viii (Ori-Dong). Japan: 14.v-29.vi (Honshu); 16.vi-18.viii (Hokkaido). Russia: 3.vi-15.viii (Khabarovskiy Kray); 8-27.vi (Amurskaya); 8-29.vi (Primorskiy Kray); vi-vii (Amurskaya); 4-21.vii (Khabarovskiy Kray); 4-21.vii (Khabarovskiy Kray); 6-28.vii (Primorskiy Kray); 15-16.vii (Transbaikalia); vii-viii (Primorskiy Kray; Transbaikalia); 15.viii (Khabarovskiy Kray). Depending on latitude and weather, there is one to four generations a year, with adults flying between April and September. Two generations are usual in Beijing and Ningxia, three in southern Shaanxi, and four in Jiangsu and Jiangxi (Chu et al., 1979). Izerskiy (1999b) gives late May until early August for the Russian Far East. Park et al. 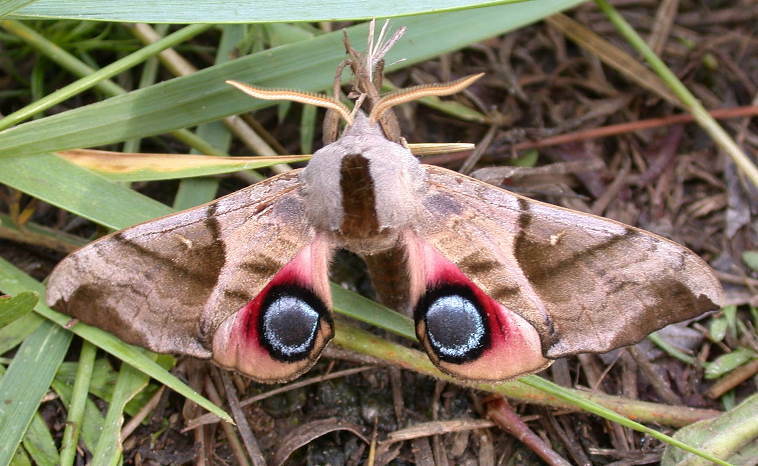 (1999) give early May until late July as the flight period in Korea, although specimens have been found in August. OVUM: Pale green, becoming greyish white prior to hatching; oval (1.6 x 1.9mm), very shiny and smooth. Laid singly or in pairs beneath leaves not more than 2m above the ground. LARVA: Full-fed 70--90mm. Dimorphic: bluish green or apple-green. 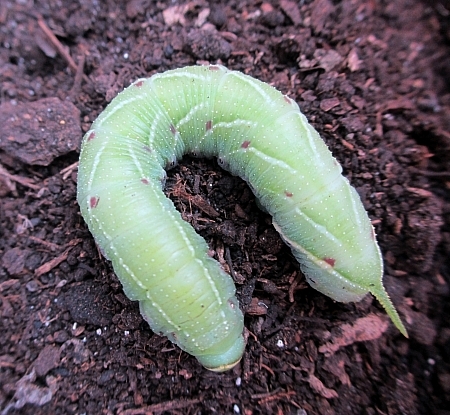 On emergence, the young larva is about 6mm long, pale whitish green, with a reddish-black horn. It clings tightly with all legs to a vein on the underside of a leaf. 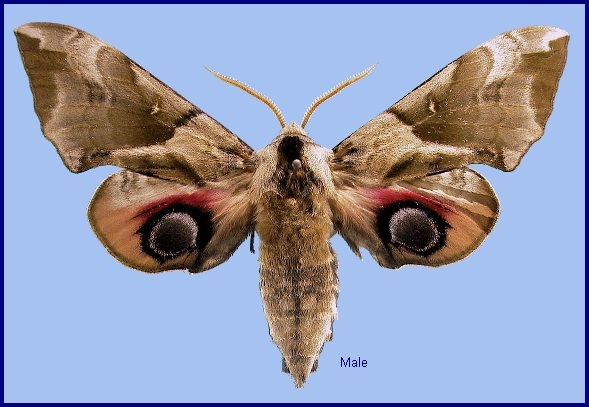 In the second instar, pale lateral stripes appear, the head becomes dorsally pointed and, when not feeding, it rests in a typical sphinx-like posture, holding on with the last three pairs of prolegs only. 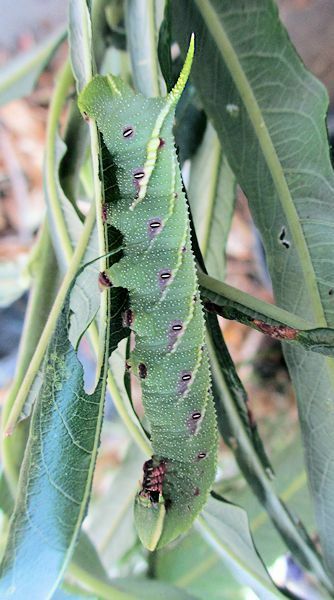 When so positioned beneath a leaf, the larva is very difficult to detect due to its excellent counter-shading. 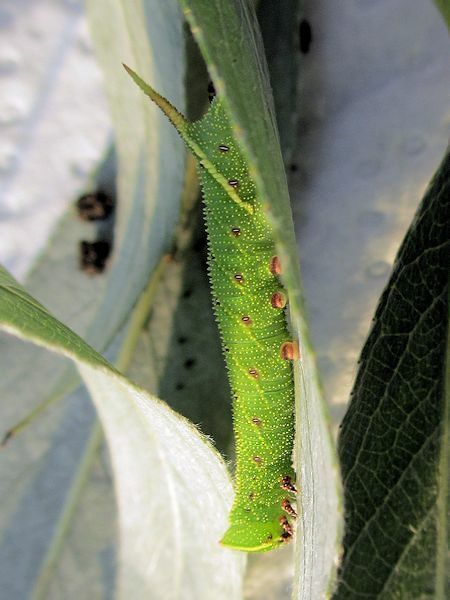 The fully-grown larva resembles that of Smerinthus ocellata in both behaviour and morphology; however, the body tubercles are more coarse, the white lateral stripes more bold and the horn less blue. 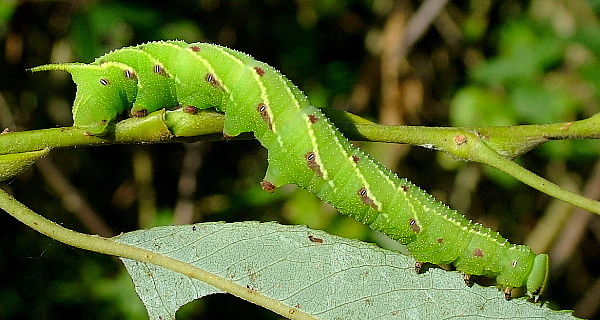 As with Smerinthus ocellata, many larvae in a colony may perish in any one year due to parasitoids, such as Microplitis ocellatae Bouché. PUPA: 35--48mm. Indistinguishable from that of Smerinthus ocellata. Larval hostplants. Recorded in China on various species of Malus, Populus, Prunus and Salix (Oberthür, 1886; Mell, 1922b; Chu et al., 1979; Chu & Wang, 1980; Xiao, 1992; Wang, 1992; Wei et al. 1999). A record on Ulmus (Wang, 1988) is probably erroneous. In Beijing mainly on weeping willows, e.g. Salix babylonica. Izerskiy (1999b) gives Populus maximowiczii, Populus koreana and various species of Salix for the Russian Far East. Recorded in Korea on Salix koreensis, Populus maximowiczii, Rosa hybrida, Prunus mume, P. serrulata var. spontanea and Malus pumila (Park et al., 1999). Ichneumonidae: Callajoppa exaltatoria (Panzer), Callajoppa lutoria (Linnaeus), Netelia cephalotes Holm. ; Braconidae: Aleiodes praetor (Reinhard), Cotesia planus (Walker), Cotesia suzumei (Watanabe), Microplitis ocellatae Bouché; Tachinidae: Winthemia angusta Shima, Chao & Zhang, Exorista sorbillans (Wiedemann). China: Xinjiang (Yili area); Nei Mongol (Great Khingan Mountains, Zalantun/Butha Qi; Qingshuihe; Dengkou; Alxa Youqi); Heilongjiang (Harbin); Jilin (Changbai Shan); Liaoning (Liaoyang; Changhai, Dachangshan Island); Hebei; Beijing (Haidian; Baihua Shan); Tianjin; Shandong (Jinan; Weihai); Shanxi (Qixian; Taiyuan; Taigu); Shaanxi (Louguantai Forest Park; Xunyang, 1380m); Ningxia; Qinghai; Gansu; Henan; Jiangsu (Nanjing); Anhui (Mt. Huang Shan); Shanghai; Zhejiang (Tianmu Shan); Hubei (Enshi; Hefeng; Xuan'en); Sichuan (Kangding, 2540m; Pengshui; Wulong near Fuling; Emei Shan, 1000m); Yunnan (Kunming); Xizang/Tibet (Mutu, Namjagbarwa region, 850m; Nyingchi, Namjagbarwa region, 3050m); Guizhou (Jiangkou; Leishan); Hunan (Dayong; Shangzhi; Zhangjajie; Heng Shan); Jiangxi; Fujian; Guangdong (Guangzhou); Hainan. North Korea: Kangwon Prov. (Keumgang-san); North Hamgyong Prov. (Jueul); North Pyongan Prov. (Chonma County, Chonma-san); South Hamgyong Prov. (Hamhung; Wonsan; Seokwang Temple; Pulgaemi ridge above Pukchong City, 1500m). South Korea: Baengnyeong-do & Daecheong-do; Seoul; Kyonggi Prov. ; Kangwon Prov. ; North Chungchong Prov. ; South Chungchong Prov. ; North Cholla Prov. ; South Cholla Prov. ; North Kyongsang Prov. ; South Kyongsang Prov. ; Cheju Prov. Japan: Hokkaido (Kushiro; Tokachi; nr Sapporo; Rishiri Island; Sounkyo); Honshu (Nashimoto; Tokyo; Yokohama; Yamagata; Tottori; Yazu); Shikoku; Kyushu. Russia: Transbaikalia (Lake Zun-Torei; Mt. Maly Bator; Nizhniy Casuchey; Myrgen (Torei Lakes); Shara; Undino-Posel'e; Taina); Amurskaya (Belogorsk; Blagoveshchensk; Uril); Yevreyskaya (Pompeyevka; Bastak); Khabarovskiy Kray (Khabarovsk; Bolshekhekhtsyrskii Nature Reserve, Khabarovsk suburbs; Slavyanka; Pivan); Primorskiy Kray (Andreevka; Barabash; Jankowski Peninsula; Lesogor'e; Narva; Vladivostok; Primorskiy; Bukhta; Khasan; Vityaz Bay; Kedrovaya Pad Nature Reserve; Pogranichniy; Novovladimirovka; Ussuriysk; near Zanadvorovka; Anisimovka); Sakhalin Island; Kurile Islands. Previously recorded from Japan, the Korean Peninsula, Russian Far East and Transbaikalia (Chistyakov, 1988), and throughout the eastern half of China, as far west as Shaanxi and as far south as Guangdong and Yunnan. The recent records near the China-Kazakhstan border (Yili area) (SACS) extend considerably the western limits of the known distribution of this eastern Palaearctic taxon (Pittaway & Kitching, 2000). This is probably the result of extensive planting of Populus and Salix trees across northern China, forming a habitable corridor that Smerinthus planus planus has exploited. Callambulyx tatarinovii tatarinovii (q.v.) has reached the same area by similar means. Holarctic; eastern Palaearctic region. Pleistocene refuge: Polycentric -- Manchurian, Japanese, Sinopacific, Sinotibetan and Yunnan refugia.